Midwest Fall Fest this Saturday! KU’s third annual Midwest Fall Fest is this Saturday, but what exactly is Midwest Fall Fest? It’s an event of the season, really. A celebration with autumn in mind. With a cool breeze that comes and leaves turning brown, it’s the perfect time to be outside. Midwest Fall Fest is packed with all kinds of activities and entertainment for you and your friends to enjoy. As we explore all that Midwest Fall Fest has to offer, make your way down to the Lied Center parking lot for a day filled with fun: October 21st from 1-5pm. There are so many good things about Fall that it only made sense to make a festival appreciating it. Although temperatures are getting cooler, the sense of community gets warmer. Come together with others on a breezy autumn afternoon and experience all this season has to offer, brought together in this one event. Whether you’re into rock ‘n roll, “thrash-grass” or rhythmic blues, there’s music for all at the Midwest Fall Fest. Nothing can make a beautiful fall evening more beautiful than listening to the music you love live! Those who like older but alternative country will enjoy a performance by Split Lip Rayfield, Fall Fest’s feature band. If there’s nothing better than plain old rock ‘n roll, stay tuned for The Toughies performance. 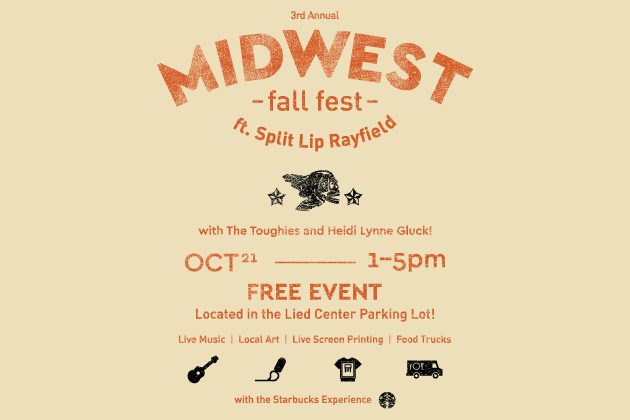 And, if the live music you prefer has more of a folksy rhythm with an indie style then you’ll be excited to hear that the multi-instrumentalist and soloist, Heidi Lynne Gluck, is also coming to Midwest Fall Fest. Whatever your music fancy, fest-goers will not be disappointed. Who doesn’t love a good food truck? Comfort food of the season will be served by La Parilla, Torched Goodness and Coney Island Hotdogs. The variety these trucks have to offer is all you need to keep you satisfied at Fall Fest. Grab a Latin American snack of your choice when you start to get hungry, and for dinner dig in on a hot coney dog. For dessert, there’s your choice of crème brulee from Torched Goodness. If none of those music styles pegged your genre, then that’s even better. The Midwest Fall Fest is about bringing diverse, new, and interesting talent and activity to the KU campus. Not only does this apply to music, though. Unique vendors from the community will also be coming to Fall Fest. These include local artists, screen printers, and food trucks! Treat yourself to something new at this event filled with exciting and engaging activities, whether that be music, food, or art. Join the rest of the Jayhawk community in celebrating all the wonders of the fall season. There is so much that the Midwest Fall Fest has to offer, the only way to experience it is to go to the event yourself, and with free admission we’ll see you at Midwest Fall Fest. For more event information, visit our Facebook page HERE. ← Why You Should Be Reading Ryan Lefebvre’s The Shame of Me.